Meet Ihsan, the 26 year-old Danish Moroccan behind one of our current favourite Muslimah Instagram accounts, HijabiGoneGlobal. Ihsan has a BA in Marketing & Communications and works at travel agency Selected Tours. She is a volunteer and board member of the biggest Muslim youth organisation in Denmark called Munida (www.Munida.dk) where she also undertakes Islamic studies including Aqeedah, Seerah, Fiqh and hadeeth science. 1.You travel quite regularly. What are your top 3 tips for maximising your income so as to travel as much as possible? When you’re in your home-country: Don’t shop on things that you don’t need and don’t spend money on eating out (any more than necessary). If possible, travel during low season and work during high season. For example, travelling to Thailand is cheaper in November than travelling in July. Also, if you aren’t fussy about where you travel to, find the cheapest flight ticket out at the particular moment you have your vacation by using Skyscanner’s ‘Everywhere’ search-option. Don’t go on luxurious trips – what’s more important are the moments that you create, not which hotel you are staying at. Make compromises: more travels mean less of something else (you choose your compromises). 2.You recently returned from Cuba, one of the most popular up and coming travel destinations of 2017. What was the highlight of your trip, if you had to choose only one? Fighting my fears and going horse riding in Cuba. This is not an easy question and I’m the worst at choosing only one! I am a person who enjoys small moments; everything from praying fajr outdoors on the rooftop; watching the stars and listening to the sea; small talk with the locals and meeting Muslim travellers. 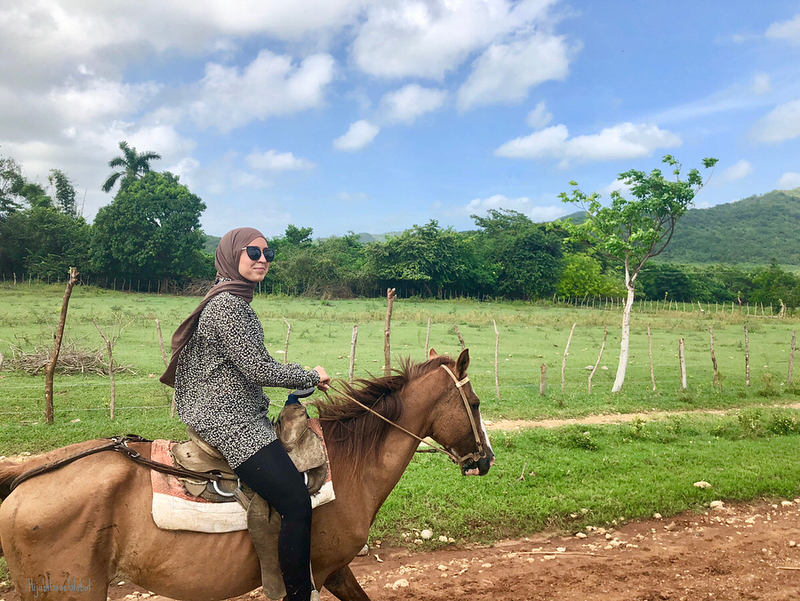 Each city that we explored felt different, but I guess, if I’m only allowed to choose one, it would be horseback riding since it has been something I had feared for a long time – so to finally horseback ride again and TWICE in Cuba was a big accomplishment for me. 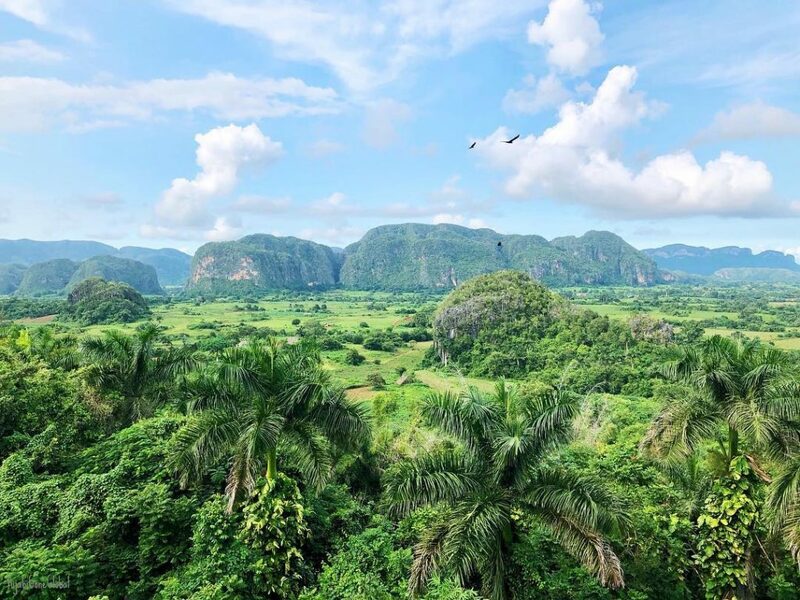 3.On your Instagram you say that ‘Cuba is special, it isn’t a country like any other’. What is it, in your opinion, that makes Cuba so special? The world has become a much smaller place and whether you are from Malaysia, Morocco or Denmark, youth cultures are becoming increasingly similar. Young people all over the world are listening to the same mainstream music, eating the same mainstream food (McDonalds) and wearing the same mainstream clothing (H&M etc.). 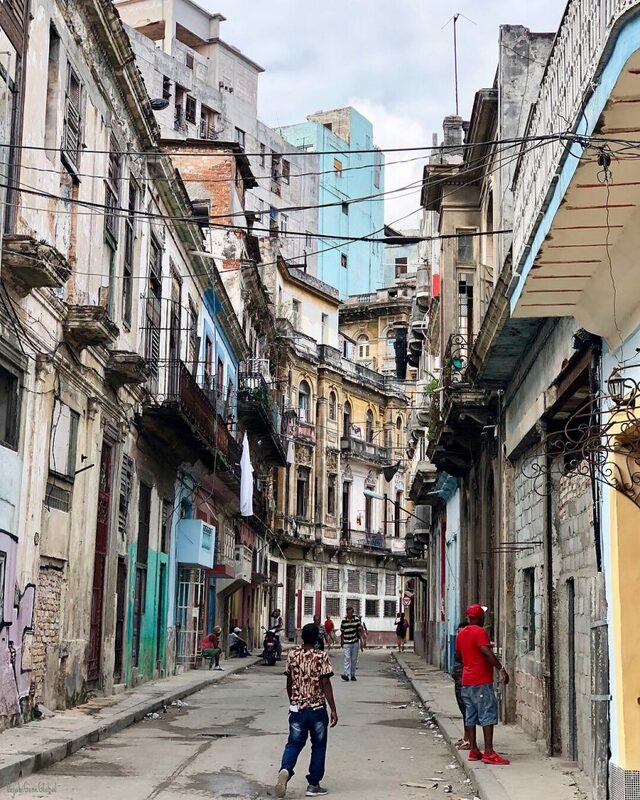 This globalisation is a phenomenon that has not yet hit Cuba though, due in part to the fact that the country has resisted American influence for decades. Cuba is a country that is more or less the same as it was in the 1950s. Seeing the old buildings in Havana, the old town in Trinidad, and visiting Baracaoa (the most remote city of Cuba) were incredibly unique experiences! I have been to more than 30 countries and I have had internet access on all of my travels – but in Cuba this was limited, and it was special to see families in a public-square with their laptops skyping with their family from abroad – that’s a sight you won’t see anywhere else in the world. It is special because while you walk in the streets of Cuba you won’t see billboards with mainstream commercials but you will see billboards with pictures of/quotes from revolutionary heroes. All of this is what makes Cuba special. 4.If you could share one travel tip for visiting Cuba, what would it be? In a country with little to no internet, it is helpful to download apps that can be used offline. I recommend ‘maps.me’ and be sure to download the offline map of Cuba, along with the ‘Spanish Offline Translator App’ which is essential as English is not widely spoken. Bring a medicine bag with all the essentials – The Pharmacy won’t give you anything without visiting the doctors first – even painkillers or allergy pills. 5.One thing we love about you is that you are not shy to pull out your burkini in public, and good for you! Where are the two most friendly and unfriendly places where you swam in a burkini? 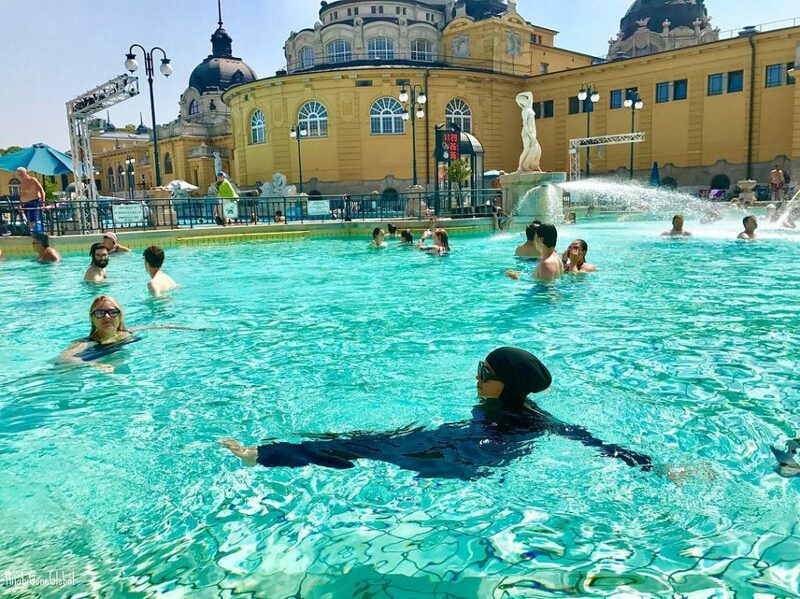 Swimming in Budapest, at the outdoor Szechenyi Spa, Courtesy of HijabiGoneGlobal. I try not to care about people’s opinions or stares – even if I can feel their eyes boring into the back of my head. I keep telling myself ‘my hijab does not limit me in any way (as long as what I am doing is permissible/halal)’. Sometimes I find it’s not that easy not to care, and people’s stares can be really annoying. But with all my burkini-experiences I wouldn’t even classify ONE as unfriendly. In many Asian countries, the locals wear long sleeves and long shorts/trousers when they swim. I did experience a lot of staring while swimming in the thermal baths of Budapest and on the beaches of Malta, but I believe it was because of curiosity and not because of racism – and I don’t blame them. 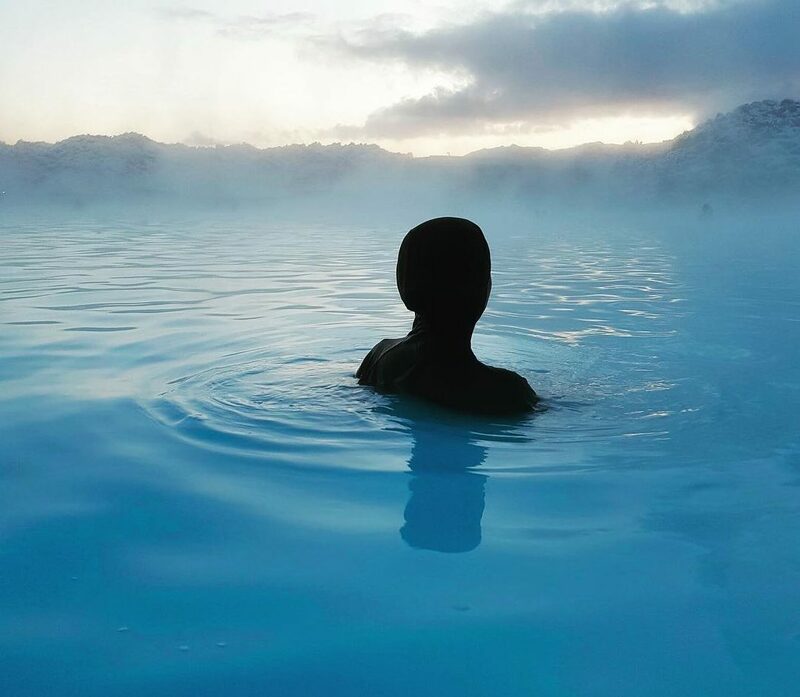 I didn’t even experience any problem in the Blue Lagoon in Iceland, only smiles from strangers! I was expecting more staring while swimming in Cuba but people were incredibly kind and many even came over to say hi and have a chat with me and my friends. 6.Can you tell us a little about what it’s like to be a Muslimah in Demark? 7.What do you look for when deciding where to travel next? 8.What is the most Muslim-friendly non-Muslim destination you have visited, and why? Out of the 27 non-Muslim countries I’ve visited I would choose these countries to be the friendliest: Scotland, Malta, Sweden and Philippines. But if it has to be Muslim-friendly (meaning; halal restaurants and mosques) then my vote would go to Thailand. You will find many local Muslims, halal restaurants, mosques, private beaches (in the full meaning of the word! ), amazing scenery and kind people. I definitely have many more good memories than bad ones – alhamdulillah! I can only think of one bad incident in all my travels that has left a negative mark on my memory. It’s from my travels to Cuba: My friend and I were used to people stopping us in the streets for small talk and to ask questions. Many asked me about my hijab and the reasons behind why I wear it, and all of them were respectful. On our last day in Havana, we asked a local for directions and he then, like many others, asked me about my hijab. He says to me (in Spanish): “Hey, why are you wearing that (and points his finger around his head; meaning; my hijab)?”. I reply (in Spanish) with a smile: “Because I’m a Muslim”. Then he replies: “Oh just make sure you don’t bomb anything here in Cuba” and laughed – and I laughed with him while walking away – until his words started getting to me. My Spanish is not fluent; I can hold a basic conversations, but I cannot talk in detail about my reasons for hijab. Anyway, after a few minutes I had the chance to reflect and I realised that the incident had affected me more than I thought. I was extremely sad – not sad because I felt “attacked” but because he and many other people probably have NEVER seen a Muslim or NEVER talked to a Muslim – they only know what the media tells them. I really don’t mind questions, but it accusations bother me. I hope that people around the world are not afraid of asking, and I hope that Muslims don’t mind when people ask them questions about Islam – it is our responsibility to answer – cause if they can’t ask us, who should they ask? 10.You first started travel blogging in 2015 during your study abroad programme. Would you say that the experience was a defining moment in your life? My travel “addiction”started during my study abroad programme in Malaysia. When I came back from Asia, having spent 6 months there, the ‘holiday blues’ hit me hard. You know how you scroll through your holiday photos after a trip away? Well I did that and it soon became a great way for me to relive my experiences. It was soon after this that I decided to share my photos and experiences with other people. I created my Instagram account in Feb 2016 to share with even more people – never did I anticipate that HijabiGoneGlobal would gain 14k followers :-). 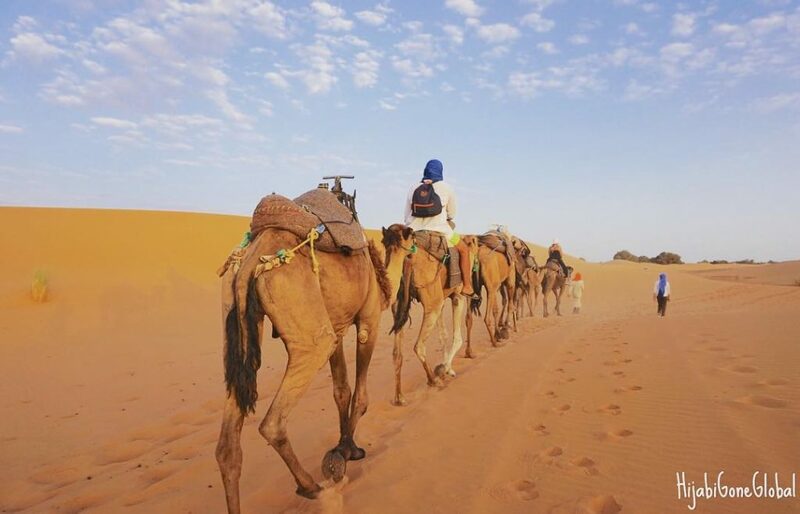 My experiences during my study abroad programme have definitely changed me as an individual. Seeing how other Muslims could live together in such a peaceful, modern and multicultural society (which is how it seemed to me) had a great impact on me. We all know that Muslims are not a homogenous people, and for me to meet a population that was so calm, down to earth – normal – and at the same time, religious… it was unlike any other experience I had ever had, and it was great. With these new experiences and making different friends along the way, my perspective on life has changed. No more is my life about only working, shopping or paying bills – we have to take time to enjoy the world that God has created! 11.What advice can you give to Muslim girls who want to explore the world but, for whatever reason, do not feel confident enough to do so without family? This is a question that I receive often, and have a difficult time responding since every Muslim girl has her reasons. Many girls (or their family) are of the opinion that a Muslim girl should not travel without a male-relative (mahram). If it is a religious reason then I really don’t have anything to say. Personally, I do not travel solo because of my religious belief, but I travel with a friend or family members. If the lack of confidence is because you don’t feel safe, then pack your negativity aside and do some research to be more confident. Thousands of girls are traveling the world solo or with friends, and the statistics of something bad happening are low. Just remember that something bad can happen in your home country as well! Before I travelled to Cuba, for example, I did my research by googling and approaching people that had already been (which is extremely helpful). I also recommend joining travel groups on Facebook, where you can ask “solo female travellers” (this is a group on FB) and learn from their experiences. You will be safe insha’Allah. 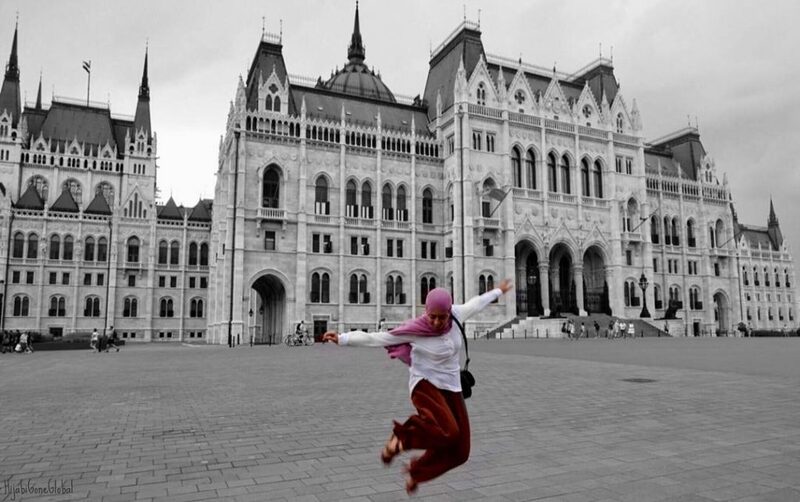 Follow Ihsan’s travels via her Instagram page, @HijabiGoneGlobal.